An information service about the position of underground utility supply lines for construction companies that plan to excavate in a given area is one of the standard tasks for utility companies to fulfill regulations and protect their infrastructure. This service is often called “Click-Before-You-Dig” as it is nowadays provided through an automated web site. AED-SICAD has now completely re-designed its click-before-you-dig solution into a very slick and reduced design, based on latest IT technology. CBYD End-users will experience a simple and responsive User Interface based on ArcGIS for Server. In the User Experience the actual map plays a prominent role. Only those functions that are really needed within the individual click-before-you-dig process steps are displayed. 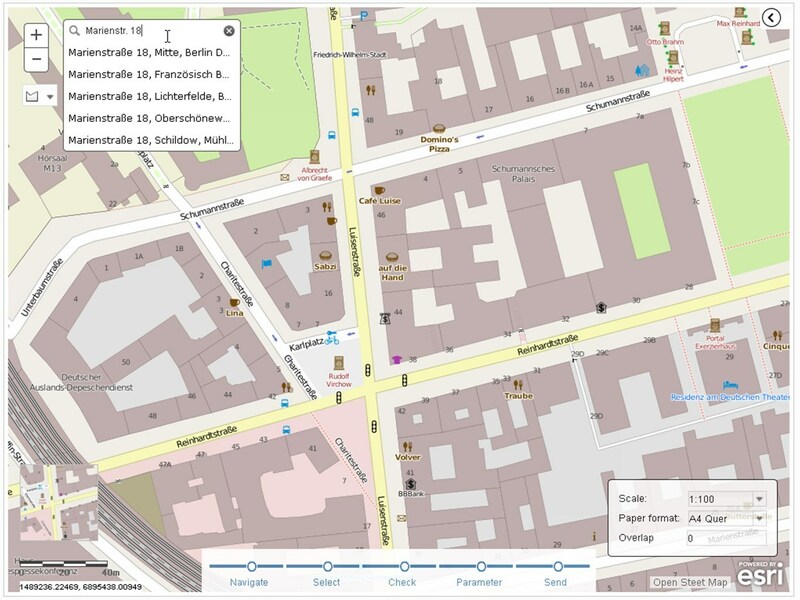 Background maps that are displayed during the navigation may be changed with a click to suit the end users’ needs, e.g. to an orthophoto from ArcGIS Online or Arc­GIS for Server Map Service. Within the first step, users may navigate to the area of interest. For this, a one-line entry window is available, where users only need to start entering the street and the system will start suggesting streets and cities (auto-completion). 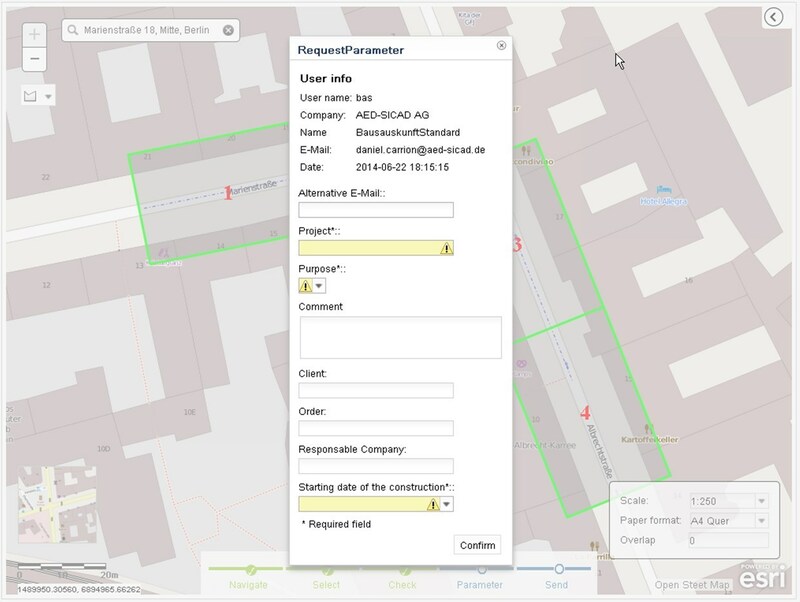 The underlying Esri Geocoding services can be configured for a certain area so that only streets within this area will be proposed. Alternatively, own address data may be used for geocoding. Next, the user can define the extent of the area to be queried. This can be done via a rectangle, a polygon or a line. As soon as the area has been drawn, the system will display the extents of the calculated map sheets, based on the currently selected scale. Most users will probably use the line to query the system since many construction sites are along a street. 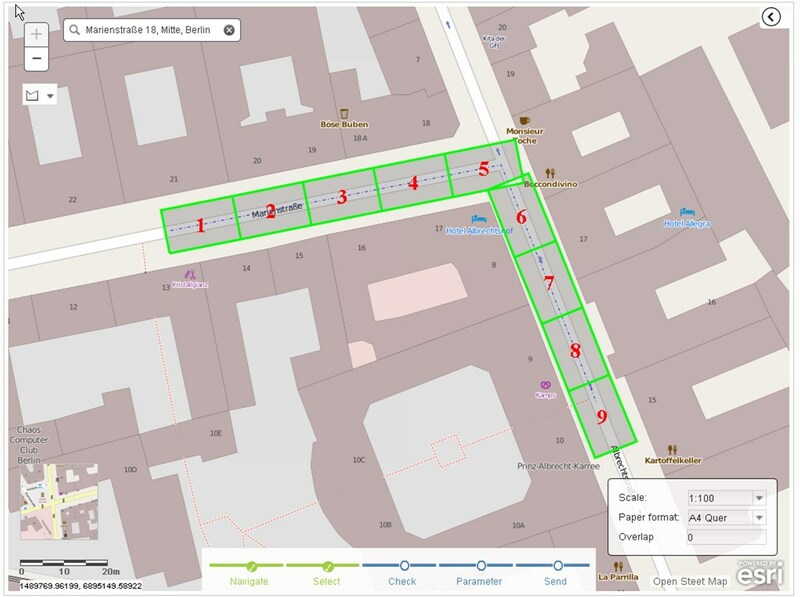 Many small functional details increase user satisfaction: Overlap between map sheets can quickly be adjusted; single map sheets may be moved interactively, the scale and output format may be adapted and the system will re-calculate automatically the map sheet distribution. In the last step, users must enter some additional information, like e.g. reason for asking for information, project number etc. Administrators may define mandatory input fields. AED-SICAD will also provide functionality to re-use previously entered project data for renewed inquiries with updated time stamp. Once all data are entered, the request is sent and queued for processing and the user can immediately continue to define the next query area. 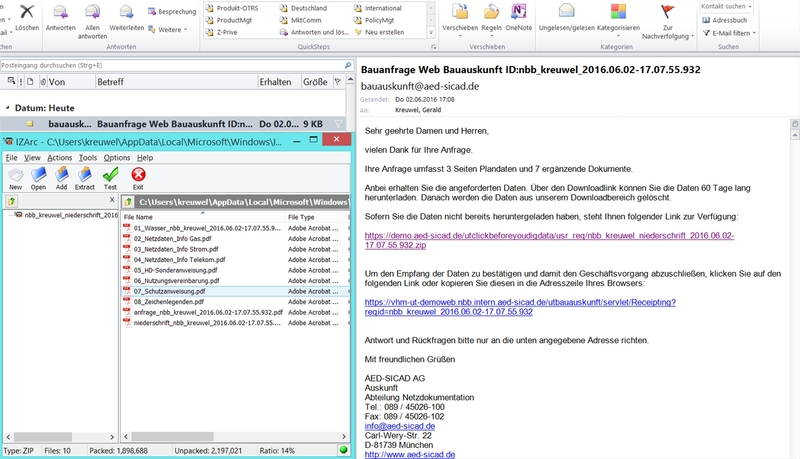 The system generates on the server a zip-file to be sent to the applicant. This contains not only the requested maps for all branches configured (e.g. electricity and district heating), but also static documents like e.g. disclaimers, legend etc. The applicant will receive an email with a download link when the file is available. An administrator will define which users are allowed to access the application. Users may construction companies, but also utility company employees. We provide tools for the administrator to protect the access to the application by robot attacks. All requests are logged securely on the server and may be filtered by the administrator through a variety and combination of filters. 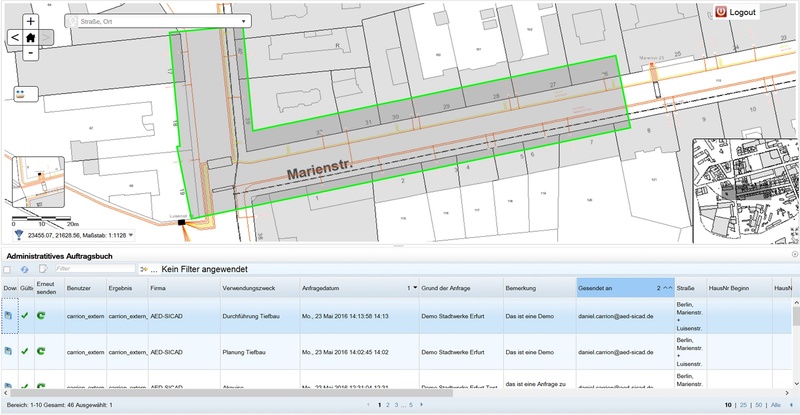 Through a graphical user interface we can search requests for information by spatial constraints and/or by attribute selections.